Volunteers mill around Cambridge City Hall during the city's annual Martin Luther King Day of Service, held Monday. Braving strong winds and frigid temperatures, more than two thousand Cambridge residents descended on City Hall and Central Square Monday for Cambridge’s annual Martin Luther King, Jr. Day of Service. 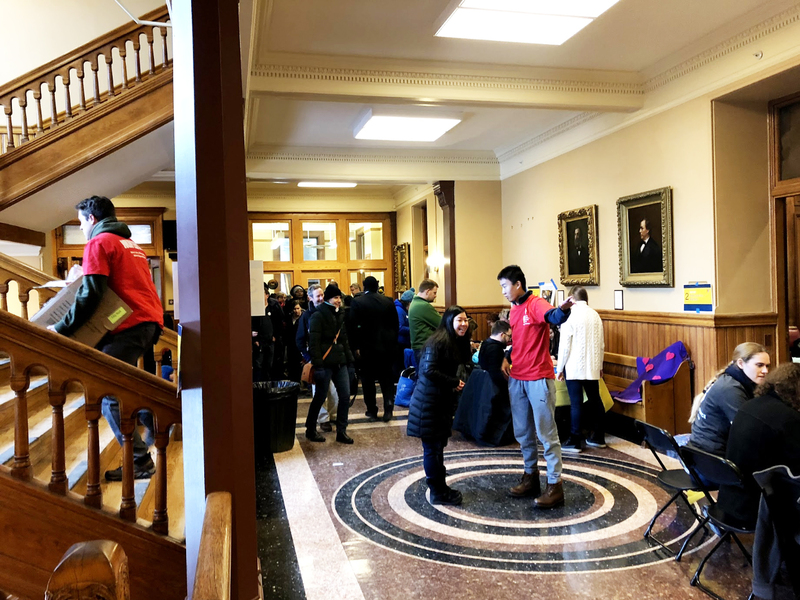 Event attendees made fleece scarves and blankets for homeless and low-income people in Cambridge; sorted food and winter clothing donations; and crafted valentines for seniors, veterans, and active military overseas. By the end of the day, volunteers had made more than 3,000 valentines, collected more than 1,000 pounds of winter clothing, sewn more than 600 scarves and blankets, and delivered nearly 350 bags of groceries to 18 local food pantries. Many Helping Hands 365 — a Cambridge group dedicated to mobilizing volunteers and facilitating service opportunities — organized the event, which the organization has coordinated every year since 2010. The Cambridge Day of Service is one of the largest community service events in New England, according to the group’s website. “It’s a unique opportunity for neighbors to work side by side to accomplish something for those in need,” the website reads. 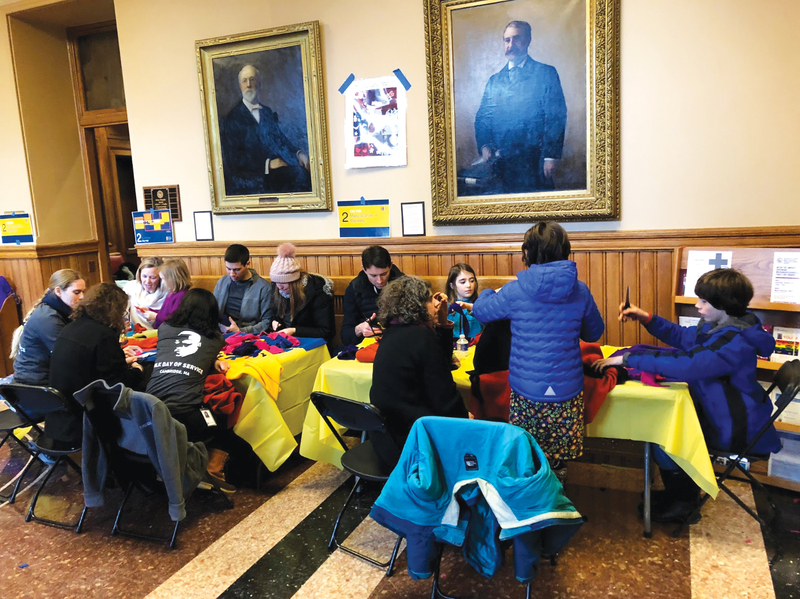 Volunteer organizer Amy S. Bamforth, a social worker who said she has helped coordinate the Day of Service since the event began, oversaw volunteers who made scarves and blankets for the homeless and families in need. “I just think it’s important to help out other folks, and I think sometimes people don’t realize how much privilege each of us have,” Bamforth said. Cambridge residents make scarves and blankets at the city's annual day of service. Presidential candidate and Harvard Law School professor emerita Elizabeth A. Warren attended the event. The Day of Service also drew some University affiliates, and several Harvard students helped organize the event. “I’m not from here, so it’s a great way to get involved in what’s going on in Cambridge,” he said. Reverend Ellis I. Washington, another volunteer in attendance, also decided to participate in the event as a way of honoring King’s memory. He said the best way to pay tribute to King’s “life dedicated to service” is to help those in need. Though Washington was initially supposed to deliver a speech about King’s legacy in front of City Hall, event organizers decided to cancel his remarks because of the sub-freezing temperature. Josephine T. Mullen, a Cambridge resident and a first time participant in the event, said the Day of Service offered her an opportunity to become more involved in her community. “I’ve always wanted to come,” she said. The Day of Service also drew one particularly high-profile Cambridge resident: United States Senator and presidential hopeful Elizabeth Warren attended the event and spoke with volunteers and organizers alike. Both attendees and coordinators said the event marked an important chance to participate in community service. —Staff Writer Declan J. Knieriem can be reached at declan.knieriem@thecrimson.com. Follow him on Twitter at @DeclanKnieriem.